Implementation of patrols, law enforcement, and conservation projects in the Eastern Plains Landscape (EPL) is a challenge to say the least. Covering 27, 400km2, it is a vast expanse of dry forest, evergreen forest, and wetlands. While creating a unique habitat for endangered species such as Asian elephants, leopards, the ‘national bird’ giant ibis, and wild deer, it also attracts illegal activities such as logging and hunting to sell wild bush meat. 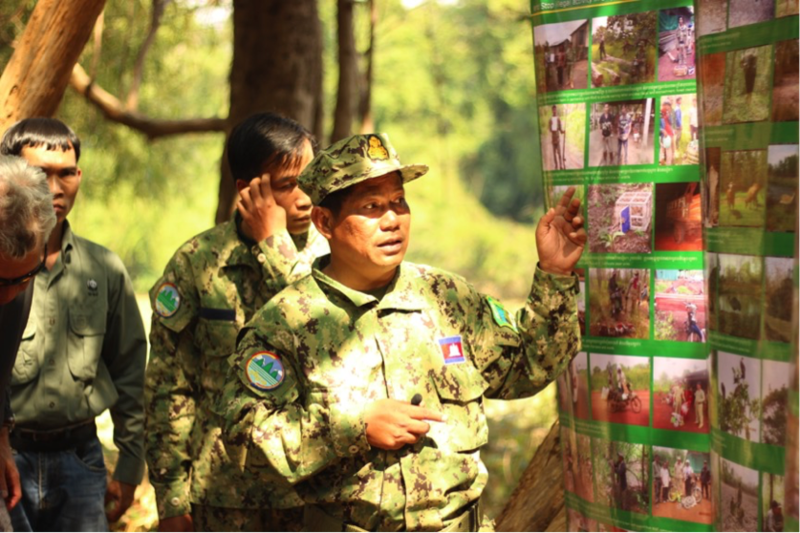 Conservation activities in the EPL are as diverse as the landscape they operate in, ranging from mobile enforcement units on standby for call outs and raids; alternative livelihood support to encourage income diversity away from illegal activities; and species reintroduction of the mighty Tiger. It is no wonder the work of WWF-Cambodia is attracting international attention from our counterparts all over the world. This quarter has seen WWF China, UAE, Japan, Belgium and cooperate partner Tiger Beer come to this corner of Cambodia to exchange knowledge, lessons, and experiences. This quarter got to a flying start with a visit from the cooperate partner Tiger Beer. As a key stakeholder, Tiger is investing USD1 million in the first year of the 6 year partnership to WWF, and part of the fund goes to Cambodia to support our tiger reintroduction program. They visited the Srepok Wildlife Sanctuary (SWS) to understand and see our work in practice, but also to produce a film focusing on the rangers’ work and challenges to help their worldwide supporters understand how vital the tiger reintroduction is to the EPL. WWF Belgium, China, and UAE visited the EPL to observe our law enforcement practices and to learn how they can be integrated into their own projects. As part of the visits, they accompanied the rangers on a patrol to get a detailed understanding of what life is really like in the field, see confiscated objects, and track animals. Additionally, WWF Japan visited to observe the actions in the Srepok Wildlife Sanctuary (SWS) and the potential it has as a framework to benefit their conservation projects. The quarter finished on a high note when members from WWF Cambodia, Bhutan, Nepal, UAE, Wildlife Conservation Society (WCS), and park managers came together in Phnom Penh to attend training on the new connect spatial monitoring and reporting tool (SMART connect). This new technology replaces the need for separate GPS, camera, and record book, combining them on one device for patrol monitoring and data management, making patrols more efficient and easier for rangers. The immediate outcomes of these visits are — exposure to and experience of the different practices of other WWF colleagues as well as cultural exchanges that help WWF maintain its global presence and mandate. In the longer term, if colleagues are inspired or encouraged with what they learn, it then filters down to their own practices, allowing for changes in strategy plans, policies, and day-to-day operations. These visits are highly important for the global WWF community mandate as it furthers understanding of conservation, improves practice, and encourages collaboration to fulfill our international slogan: together possible. 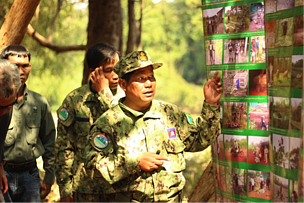 A ranger was showing photos of patrolling activities.